Can You Eat Fish from the Hudson? Chemicals in Hudson River fish can harm your health even if the fish look healthy and the water looks clean. These chemicals--called PCBs--may be more harmful to young children and unborn babies. 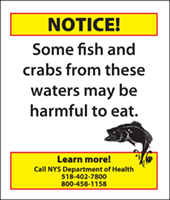 Do not eat any fish or crabs from the Hudson River south of the Corinth dam. See the advice about eating Hudson River fish. Follow advice about eating fish and crabs from the Hudson River. 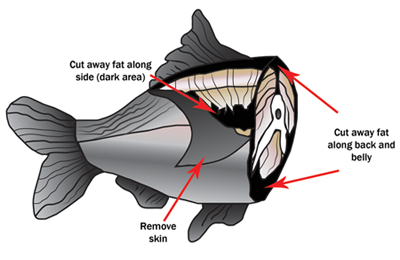 Follow the advice diagram to reduce PCBs, which are in the fat of fish. After trimming as shown, broil, grill or bake the fish on a rack so that fat drips away. Do not pan-fry the fish or use drippings to make stock or sauce. Use our order form to request copies of free fish advisory publications. Wallet-size angler advisory cards that detail which Hudson River fish men over 15 and women over 50 can eat, and which fish they should not eat. The advice about eating fish varies depending upon the location on the river. Can You Eat That Fish From the Hudson? An 11"x17" poster in English or Spanish for your community space. A 20-page activity and coloring book for schools, health care waiting rooms and Hudson River community events. This brightly colored 4"x4" magnet illustrates the important message of how to reduce PCBs in fish. Also available in Spanish, Quite la grasa. Free Hudson River fish advisory signs (coated 12" x 14" aluminum with mounting holes) are available to municipalities and other Hudson River property owners. Also available in Spanish. Read or listen to our public service announcements about the Hudson River fish advisory. The Hudson River Fish Advisory Outreach Project is a multi-year initiative of the New York State Department of Health. The goal of the Project is for all anglers and others who eat fish from the Hudson River to know about and follow the New York State fish advisories. The project area extends from Hudson Falls to the New York City Battery (PDF).